I thought that I would take the data from the Silver (2006) that I’ve previously discussed and share it in a different way that would be helpful to women with multiple prior cesareans. (You might find it worthwhile to read this article specifically, where you can view the data below in graphs, as well as other articles on placental abnormalities first.) Remember that accreta is when the placenta abnormality deeply attaches into the uterus requiring surgical removal. There is a 7% maternal mortality rate with accreta as well as a high rate of hemorrhage and hysterectomy. One of the factors that determines your risk of accreta or previa is your number of prior cesareans. 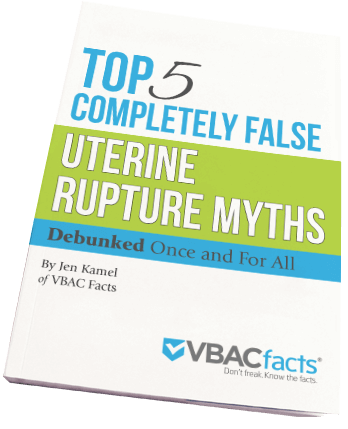 The studies that have been conducted (that I’m aware of) on uterine rupture in VBAMC are kind of small (including hundreds, not thousands of women). So I don’t think we have an accurate idea of VBA3C rupture risk. This site is a great resource. Thank you for posting. My friend had 2 previous c-sections, and with her 3rd pregnancy had the bad luck of having both placenta accreta and placenta previa (both risks of repeat c-section). Her pregnancy was awful..lots of bleeding, hospitalizations, steriods and other drugs to help hold onto the pregnancy and bedrest at 20 weeks. They couldn’t do cerclage because of the placenta previa). In the end she had a healthy baby, but a 5 hour c-section surgery where she lost a lot of blood and needed a blood transfusion of 6 units of blood. She had to have a hysterectomy and also they removed part of her bladder because her placenta had embedded so far it was attached to her bladder! She was pissed that her doctor never warned her of the risks of repeat c-sections. She is 39 years old. That means the risk of accreta increases 887% from the first pregnancy – a huge jump. So, if it was me, getting that ultrasound and knowing I didn’t have these complications would give me huge peace of mind. A good place to start on info is here. I’ve also posted your question on Facebook to get additional feedback. The risks of cesareans increase at a statistically significant rate as the number of prior cesareans increase. There are women who have VBACs after three cesareans (VBA3C), but it can be hard to find a care provider depending where in the world you are. The evidence on the risks of VBA3C is limited, but you can review what we know here. I’ve also posted your comment on Facebook so you can get more feedback. Dina, I’m so sorry you were lied to! I was as well. My dr told me that VBACs were incredibly dangerous and that it was safe to have 9 cesareans. She told me that the risks do not increase and then downplayed the initial risks. She didn’t tell me about placenta problems, either. Since then I’ve had a hard time finding an OB willing to do repeat cesareans on me (nor do they want to do VBACs) and are shocked I was “allowed” to get pregnant with my fifth, sixth and seventh pregnancies. Like you, if I had known I would have insisted on that first VBAC. She was frank breech but only 5 lbs/34 weeks and I was nearing transition. I’m now a doula and training to be a midwife and hope to help women educate themselves as well! I am so sorry. That is the secret truth about post-cesarean births. VBAC is a very important option especially for moms planning large families. It is unfortunate that family size is often not considered when moms are faced with their first post cesarean birth. As you know, once a mom has two cesareans, the number of providers willing to attend her VBACs greatly diminish if not totally disappear. It is my goal to share the information I have on this site so that women may understand the ramifications of post-cesarean birth options and how their future birth options are massively impacted by their current mode of delivery. I’m 24 weeks pregnant now and I’ve been diognosed with plasenta preevier ,acreater there not sure if it has attached it self to my bladder to this is my 4th baby now and will be my 4th csection. I’m pretty scared about when they deliver baby thoe . The good news is, you know about the accreta/previa before labor. This gives your OB time to make the necessary special arrangements that will result in a better outcome then if it was diagnosed in labor. As scary as it is, you really do have a leg up because you know so early in your pregnancy.